“I would like my work to form a new field of thinking where all contradictions are resolved and a new type of harmony governs both the visual and the logic!” Κonstantinos Patsios studied painting at the School of Fine Arts in Athens and at Rhode Island School of Design in Providence U.S.A . One of the principles in his work is the synthesis of non-matching materials, where humour and creativity go hand in hand with various symbols taken from popular culture. He has always been seduced by anatomy. Here, he presents some work where we can see his interest for the human heart. Please tell us about your multi-dimensional background and the inner force to investigate in your work the intersection of art and biological sciences. Κonstantinos Patsios: Following my parents’ steps, I initially studied Economics in Athens and in France, where I was an Erasmus student. It was during my stay in France that I realized that art was what I was really interested in. I studied Fine Art and Sculpture in Greece and Boston, and since then I am dedicated to the production of art and teaching. One of the biggest joys art gives me is its power to connect different perceptions of the world, different people and opinions. Da Vinci said that art and science are the two sides of the same coin. Therefore, regardless of whether artists consciously or unconsciously pursue this, the arts always embed a certain knowledge of natural science. Several of your artworks have been inspired by the human heart. 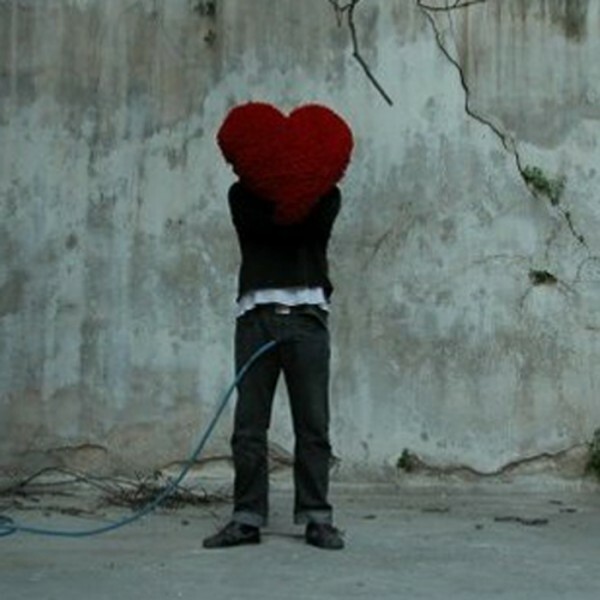 What does heart symbolize for you and in your artwork? 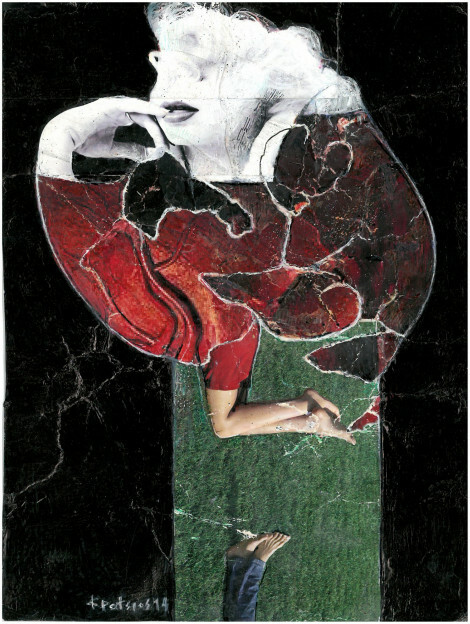 KP: Indeed, the anatomy of the human body is a recurring theme in my work. I often use the human heart, the center of the human body and the most vital body organ, in an effort to express the need to understand the core essence of humanity. The human heart symbolizes the center of a person’s being and intelligence. In their treatment of the dead body (mummification), Ancient Egyptians left only the heart in place, believing that in this way they secured the deceased’s journey in eternity. I use the human heart metaphorically as it is a powerful symbol of eternity, enlightenment, civilization, life and love in the collective human consciousness. What is the background and inspiration of your work “Mare Nostrum”? KP: In an era of religious fundamentalism, the Ηagia Sophia is identified with the lost innocence of western civilization. In the context of aesthetics, Ηagia Sophia, expresses the timeless necessity for a transition from theocracy to anthropocentrism. In my art, ancient temples and piers, human parts, harlequins and cartoon characters, all construct a hybrid world both sinister and idyllic, a new Arcade. “Mare Mostrum”, meaning ‘our sea’, is an artwork expressing the sacred religious feeling, but also the polarization and wild instincts that go hand in hand with it. It depicts Hagia Sophia, a temple that has been looted by both Christians and Muslims. A heart, with all its connotations with regards to civilization and humanity, dominates Hagia Sophia like an uncontrollable fire, while a monkey, symbolizing people’s animal instincts, is placed in the center of the temple. This contrasting imagery is an expression of how the mysticism and high values associated with religion is often overwhelmed by the human violence that has taken place in sacred monuments such as Hagia Sophia. 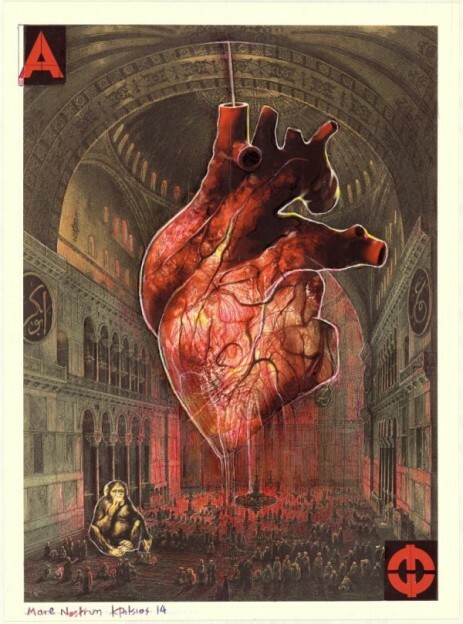 What are the symbolism and metaphors of human heart in ‘the fire in the borgo’? Does this artwork enclose a criticism to the economic situation in your country, Greece? KP: ‘Τhe fire in the borgo’ is a reference to one of the famous frescoes painted by Raphael in 1514, decorating the rooms of Palace of the Vatican. It depicts the miraculous moment when Pope Leo IV extinguishes the fire threatening Saint Peters Cathedral by giving his blessing to the Borgo district of Rome. Raphael’s painting passed a message of peace in war-beaten Italy. 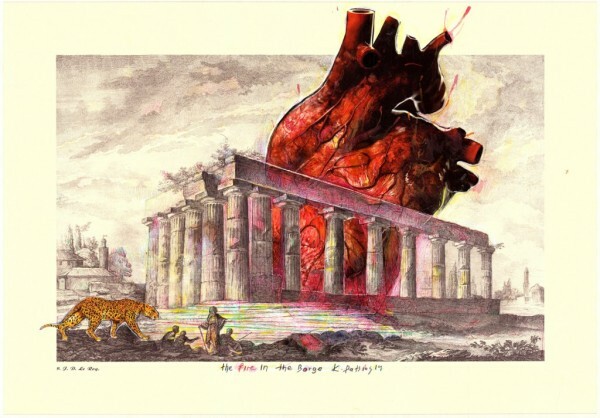 Inspired by this painting, I draw a parallelism with the current internal problems of Greece, using the most important symbol of Greek civilization, the Parthenon, and placing a heart on fire in the temple as a wild animal wonders around it. Hence, I highlight the fragile state of Greece and hope, just like Raphael, that the fire will be ceased. What is the symbolism of the heart in your artwork ‘The good son’? KP: ‘The good son’ depicts a wild pig hanging from a heart; they become one entity which overall exudes humor and tenderness. Both of the objects are made of soft materials, adding childishness to the piece. The precious organ of heart is enlarged to highlight its importance – the importance of childishness and innocent love, which are threatened by a wild animal. Once again, there is a contradiction and co-existence between violence and more positive values. Children’s souls have violent traits, which are controlled more and oppressed as they grow up. 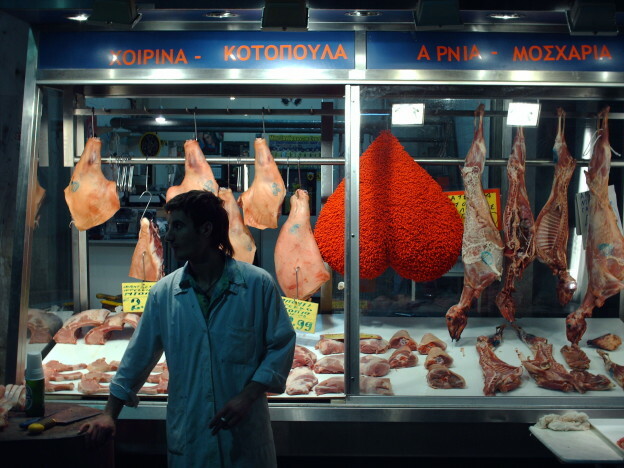 Can you tell us about your experience to place the heart symbol in the butchery store and how the employees of the store first responded to this collaboration? KP: The Fine Arts School organized an exhibition at the meatpacking district of Athens. 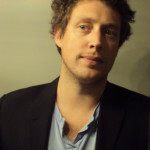 This photo was taken in the context of that exhibition specifically. The butchers’ response to this project was very positive. One would expect them to be hesitant, but they were very collaborative. In fact, one of them is posing for the photo. 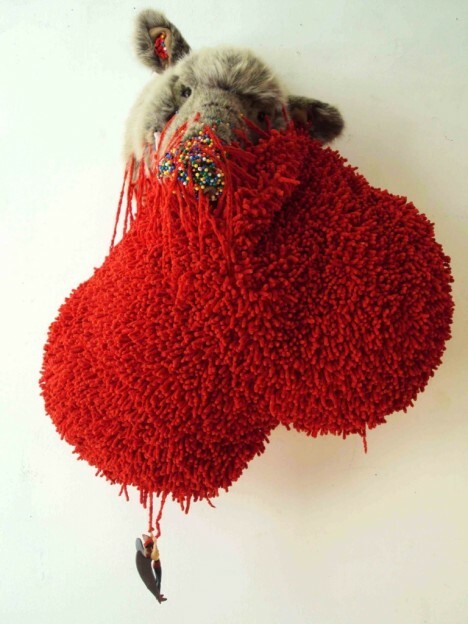 The heart was hung upside down, creating visual connotations with parts of the male human body, in an enlarged state. There is a strong contradiction in this work, combining innocence with the truculence. Which are your mechanisms to cope in such a contradictory world? KP: To begin with, one needs to accept that the world is made of contradictions and that everything – the world, the mind, the soul – has a binary existence. Love co-exists with hate. Human beings are always hovering between what they want and what they do not want, and cannot help but express that contradiction cause after all the human soul and essence is the outcome of all these internal conflicts. The second step is synthesis. We need to express all those contradictory elements somehow and to create something out of them, use this “wealth” productively. The world is black and white and gray. Art for me is about taking negative feelings and transforming them into something good, which explains why violence is very often a part of my art. Art is a war which has a creative outcome, in contrast to other activities springing out from negative feelings, like hooliganism for example. How the audience responded to this? KP: There was a strong element of surprise on the part of the audience. 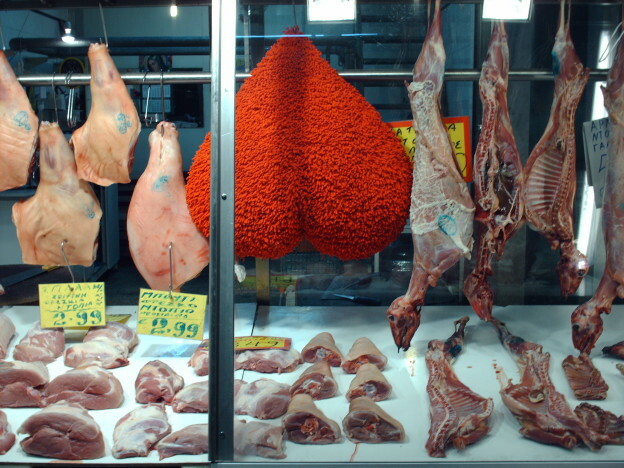 They welcomed the piece with joy though, as they soon realized how the hairy heart hanging from the butchery shop was a mockery of the human condition and existence. I am generally interested in surprising the audience through my work. This is achieved through various surrealistic methods such as the creation of compositions of opposing elements. You have stated that, in your work you “juxtapose a tangled mess in order to stop thinking and start seeing!” What do you mean by this? 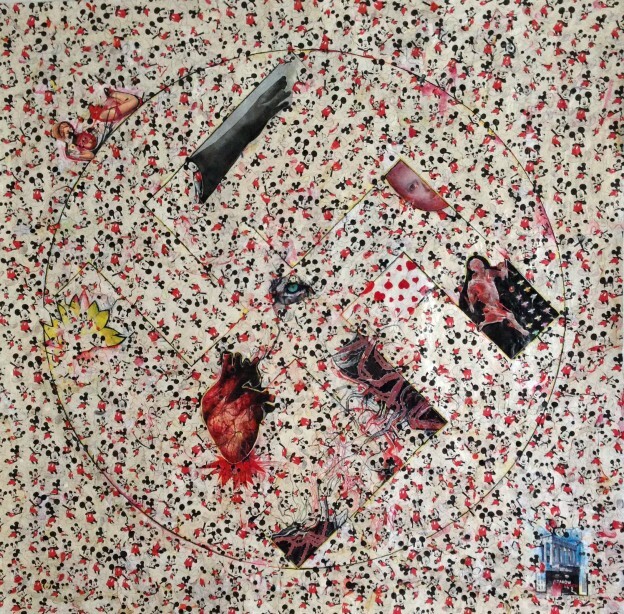 KP: I mean that the use of contradictory symbols and media initially confuse the viewer, and that confusion often distracts one from the process of thinking and trying to decode and allows him to really look at the image. People often see art as a philosophical good. An artist’s job is to enable pure vision, not written philosophy. However, I do not think I manage to achieve this aim fully, as I use quite strong symbols which create specific associations to the viewer. Could you describe a hypothetical situation that will make your heart beat faster? 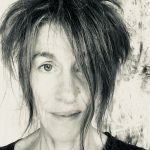 KP: The termination of a war between neighboring countries, the recognition of my art… Or smaller events like a surprise in my daily personal relationships and encounters… The creation of a piece of art… Experiencing nature’s miracles.